Seaford Town Council, 37 Church Street, Seaford, BN25 1HG. 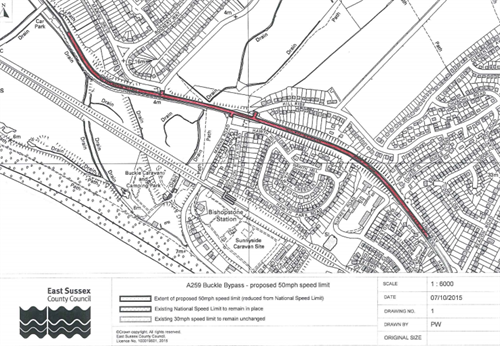 Seaford Town Council has received notification from the Communities, Economy and Transport Department of East Sussex County Council confirming that as part of their review of rural speed limits, it is proposed to reduce the existing National speed limit to 50mph on the A259 Buckle Bypass. The proposed speed limit will incorporate a number of junctions, including Bishopstone Road, Marine Parade and Hill Rise. The extent of this proposal is indicated on the plan below. As part of the scheme, East Sussex County Council shall also be reviewing the existing signs and road markings between Seaford and the Denton Roundabout and implementing improvements where appropriate. Seaford Town Council’s Planning & Highways Committee members welcomed this news. A speed reduction in this area was just recently highlighted by the Council as a priority to be sought from the County Council for the benefit of pedestrians, vehicles and cyclists alike attempting to travel safely on this busy and fast-paced stretch of road. A timescale for the proposed scheme is not yet know but is expected to be released by East Sussex County Council in due course.